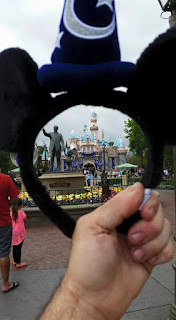 The Unlikely Homemaker: Disneyland Tips We Love! When I was pregnant with my third child, we took our first two children to Disneyland. My son was 3 at the time, and my daughter was almost 2. That trip awakened our love for all things Disney! We've been annual passholders for going on 2 years now, and in those two years, we have discovered so much useful (and completely useless yet fun) information and facts on all things Disney. Those ridiculously overpriced balloons Disneyland sells? So worth it! We actually have one here at home right now, that still has air...and it's been one full month since we came back! My advice is, buy one on your first day there, tie it to your stroller, and you'll have something to catch your eye as you're searching for your stroller in the craziness that is "stroller parking". The best Sleeping Beauty Castle photos are taken just to the right of the castle if you're facing it, head towards Snow White's wishing well. Of course, it's not a centered castle photo, but there aren't crowds of people walking around right there, and often, you can angle your camera just right, so that no one else shows up in the background! You can find a "Hidden Mickey" anywhere in Disneyland. Seriously. Your kid is having a meltdown in line? Find a kid with pigtails and show your kid that Hidden Mickey! Your kid spilled their drink and is now crying over it? Dump a little more until it's the shape of Mickey! I should add, we go to Disneyland with 5 kids. Currently they are all 6 and under. And yes, we LOVE it. Lots of fun times are had at the parks, the Lego store, Downtown Disney, and even the hotels. I'll be posting a little more about our trip planning, our Disney themed birthday parties, and Disney on the cheap(er), so stay tuned!